The teachings of Bill Eagle Feather, Sun Dance chief and medicine man of the Rosebud Sioux, as told by his apprentice. • Reveals personal accounts of important Native American rituals such as the yuwipi and the sun dance. • Includes stories and teachings from the last years of Bill Eagle Feather's life. Lakota medicine man Bill Schweigman Eagle Feather gained widespread recognition as an uncompromising spiritual leader in the 1960s when he defied a U.S. government ban on Indian religious practice and performed the Sun Dance ritual with public piercing. He continued on as Sun Dance chief and teacher of the Lakota way of life until his death in 1980. Author Henry Niese met Bill Eagle Feather during a sweatlodge ceremony preceding a Sun Dance on the Rosebud Sioux Reservation in 1975. That was the beginning of the relationship between student and teacher that is captured with humor and respect in The Man Who Knew the Medicine. Niese brings readers along on his journey from outsider to initiate to elder, a transformation guided by Bill Eagle Feather. He describes sacred traditions such as the sweatlodge, the yuwipi, and the powerful Sioux Sun Dance, which Niese participated in for 16 years on the Rosebud reservation. His firsthand accounts provide a portal into a sacred reality as well as insight into the struggles of the Indian community to perpetuate its values and religious truths in the context of contemporary America. Above all, The Man Who Knew the Medicine offers the opportunity to experience the unique personality of a fascinating individual and respected healer through the eyes of a friend and a student. Beginnings have never been difficult for me. Some people feel they have to spend a lot of time preparing. I jump right in with both feet, sometimes not even knowing what I'm getting into. Some folks have to study the thing from every angle, thinking so much about it that they forget their feelings. Not that I don't think about it. I've been paralyzed by thinking too much. It must be a common phenomenon, I've seen a lot of people so paralyzed by thought and the need to prepare that they wind up missing the boat completely, and never get started. One guy I know prepared so much for his training that his medicine man uncle who was supposed to pass on to him all the songs and ceremonies -- died before the guy was ready to accept his uncle's teaching. So I rely on my instinct and feelings a lot. Whether it's fate, or luck, or that the spirits have been watching over me, I usually come out all right. Let's call it luck. It was my good luck that put me into one particular Sweatlodge ceremony one evening at a 1975 Sun Dance on the Rosebud Sioux Reservation in South Dakota. On our great swing around the North American continent, Paula, Cody and I had left the Crow reservation in Montana a couple of days before and headed to Crow Dog's Paradise and his Sundance. Five Sweatlodges were filled with dancers. The sixth had room for one more. There were 10 or 12 dancers in the Lodge, too tired and dry from the day's dancing to say anything much, and me -- the stranger. We were waiting for someone -- a medicine man -- to come and begin the ceremony. A large, older man with long gray hair in a ponytail crawled into our Initi -- Lodge -- saying the customary "Mitakuye oyasin." He sat next to the doorway in the place where the one who conducts the ceremony traditionally sits. The doorkeeper began bringing in the red?hot stones, and one of the dancers began to arrange them, the first stone positioned in the west of the rock pit in the center, succeeding stones going to the north, east, south, and the center. He used an elk antler to move the stones. The medicine man said, "Too bad! They forgot to give us the herbs." He was referring to Hante Blaska, a special cedar placed on the rocks as incense. I spoke up, "Uncle, I have some herbs." "Well, put 'em on, nephew!" These were the first words spoken between Bill Schweigman Eagle Feather -- Sun Dance chief and medicine man of the Rosebud Lakota Sioux -- and myself. I didn't know it then, but it was the beginning of the most important relationship of my life, outside of my immediate family. It lasted for 5 years until Uncle Bill's death on September 15, 1980. He was a master teacher, and for the last years of his life, I became his dedicated disciple. He was 'uncle', and I was 'nephew' from the beginning. These relationship signifiers are always used by Indians and others not only as signs of respect, but as an acknowledgement of connection. When we were kids, my brother and I were instructed by our folks to use them in addressing friends of the family. As the sweet odor of the herbs I was putting on each glowing stone drifted through the little dome of the initi, I saw that this big, gray-haired medicine man was staring at me with a piercing look. At first, I thought that I was doing something wrong, but he said nothing. I later got used to Uncle Bill's fixing me and others with his lance-like gaze. It was his way of seeing something beyond the surface appearance of things. I realize now that this beginning contact between us was when he first "saw" me as a prospect. Later in our relationship, I realized that he was always on the lookout for people open to his teaching. Just before that sweat, I had the opportunity to participate in another ceremony, Cehpi waonye - the flesh offering. They say that you can't give anything to Wakantanka - Great Spirit - because he owns everything. You can't offer a horse, or any property. But as a token of your good intentions you offer small pieces of your own flesh as a sacrifice. I wanted to show the Creator that my intentions were good, so I lined up with others when the dance leaders announced they would be taking flesh. I was scared. I'd never done it before. How big a piece do they take? I wondered. When they asked me how many I said "Four". With a needle one of the dance leaders raised up the flesh of my upper arm, and sliced 4 pieces off with a Gillette double-edged razor blade. Then he spat on the wounds and rubbed a handful of dust on them, stopping the bleeding. I was relieved it didn't hurt too much. Descriptions of the Sun dance are available in many books - Erdoes, Mails, Archie Fire are a few of the modern authors. The meaning of the ceremony is so deep I have a hard time answering those who ask about it. Mainly I say its a way of paying your dues to the Great Spirit, but it goes a lot farther than that. Its a way of giving thanks for many blessings and healings, a way of thanksgiving for the fertility of the whole Creation, and more. Desperate times in war and peace will evoke a prayer or vow from a man - "If You let me survive this I promise to Sundance four days" - or - "If You let my mother (or any relative) live I vow to dance four days." Henry Niese (1924-2016) participated in over one hundred ceremonies and danced in thirty-seven Sun Dances, including hosting Sun Dances at his own Eagle Voice Center in Maryland. He carried on the work of Bill Eagle Feather by performing healings and giving seminars and workshops throughout the United States on medicinal plants and Native healing. He was also jazz musician and a professional artist whose paintings appeared in many museums, including the National Collection of American Art, Corcoran Gallery of Art, in Washington, D.C., and the Whitney Museum in New York City. Visit the author's web site at http://henryniese.tripod.com/. "A wonderful book full of magic, mystery and wisdom. It is a tale of the years the author spent with Lakota holy man Bill Eagle Feather, talking about life and death, laughter and sadness, spirits and the universe. This book is written from the heart. It will give you an understanding of Lakota beliefs and ceremonies. It will enrich your life." A born storyteller, Henry Niese has drawn a colorful portrait of his Lakota Sioux spiritual teacher with affection and humor and--notwithstanding Niese's own hard-earned wisdom--with humility. From this unique memoir we learn how the author himself has become a dedicated teacher and healer, a man who knows the medicine." 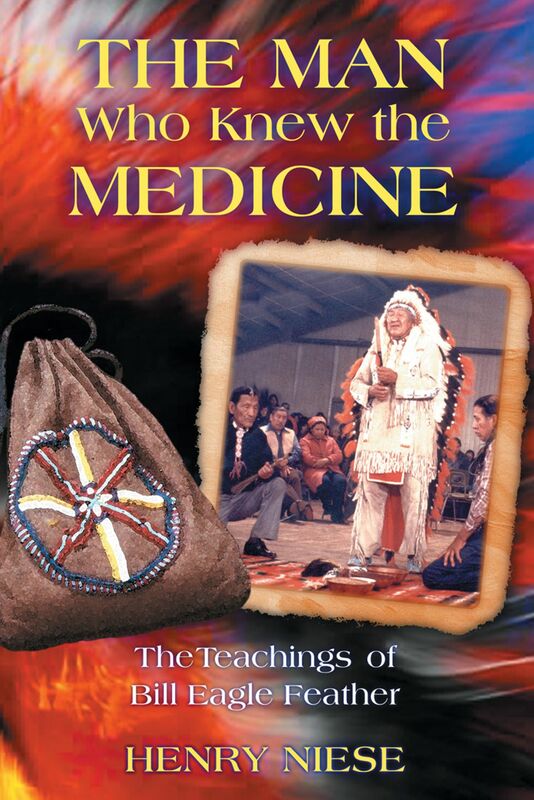 "A unique and enthusiastically recommended addition to Native American Studies collections, and an invaluable contribution to Alternative Medicine reading lists as well."